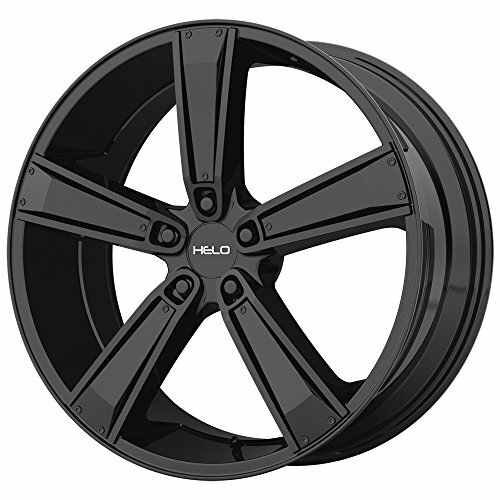 This listing is for the purchase of one (1) Helo HE899 wheel with a satin black with gloss black & chrome inserts finish. The wheel has a 17" diameter and is 7" wide with a +38mm offset. The 5x114 bolt pattern is made to fit a range of vehicles specified on this listing. Please refer to the vehicle compatibility tool to verify fitment. Don't hesitate to contact one of our product specialists if you have any questions about the diameter, width, offset, backspacing, finish, and more of this Helo HE899 HE89977012738 wheel. PLEASE NOTE: The photos included on this listing are meant to show the style of the wheel not necessarily the bolt pattern. Please refer to the details on this page for exact product specifications. Wheels should be test fit before installing. Mounted wheels cannot be returned. FITS: Many vehicles requiring a 5x114.3 bolt pattern. Use the vehicle compatibility tool on this listing to help verify fitment or contact one of our fitment specialists. FEATURES: 1-piece aluminum construction with satin black with gloss black & chrome inserts finish. FAST & FREE SHIPPING: To the lower 48 states. We offer same day shipping on all orders received by 11:00 AM PST with the exception of custom drilled wheels. INCLUDES: One (1) new Helo HE899 black wheel. If you have any questions about this product by Helo, contact us by completing and submitting the form below. If you are looking for a specif part number, please include it with your message.